Today, I exerted myself somewhat and completed the exercise that Penne gave me, back in early July. I had determined , that, for once, I would FOLLOW the tutor’s plan, and NOT DEVIATE. Yes, I really planned to imitate her steps as far as possible……well, as far as tone and colorways were concerned. I kept to Penne’s version as close as I was able with the fabrics I had at hand. Having completed the major section—–the landscape! I think I deviated a little with my “framing” of the piece, with a quarter inch “frame” of an imperial purple and gold trim. 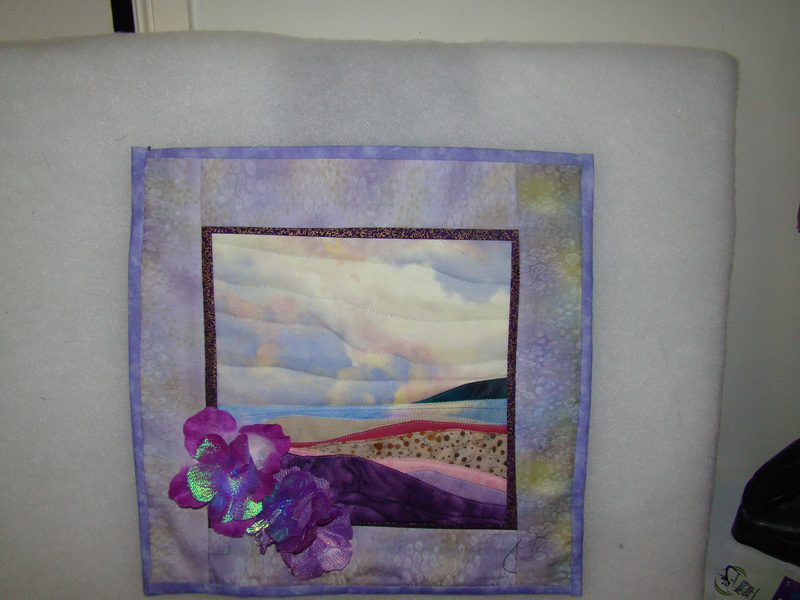 I then used a mottled (shades of) purple and lime as the larger frame. I must admit, I then made a boo-boo……and I needed to ADD another beading frame: in this case,a lavender “mini framing”. Earlier on, I suggested the possibility of adding either Trapunto/padded “rocks” in the darkish purple background, or some gemstone “rocks”…..with the idea of adding a focal point in the foreground fabric. In the end, using some flowers from a lei, I added flowers. I am satisfied with the 3D effect. Whether I add some leaves, or some leaf shaped shell pieces remains to be seen. But once again, I need thank Penne for stretching my horizons. I’ve enjoyed a ramble through your creative world. It’s an exotic place to me.